Now That Ireland Has Repealed Its Abortion Ban, Will Belfast Follow? : The Two-Way The answer is complicated: The fate of Northern Ireland's own ban hinges not just on the opinions of its residents but on the broader political scene in the U.K.
Now That Ireland Has Repealed Its Abortion Ban, Will Belfast Follow? Demonstrators gather in Dublin on Saturday, awaiting the final results of Ireland's referendum on abortion. 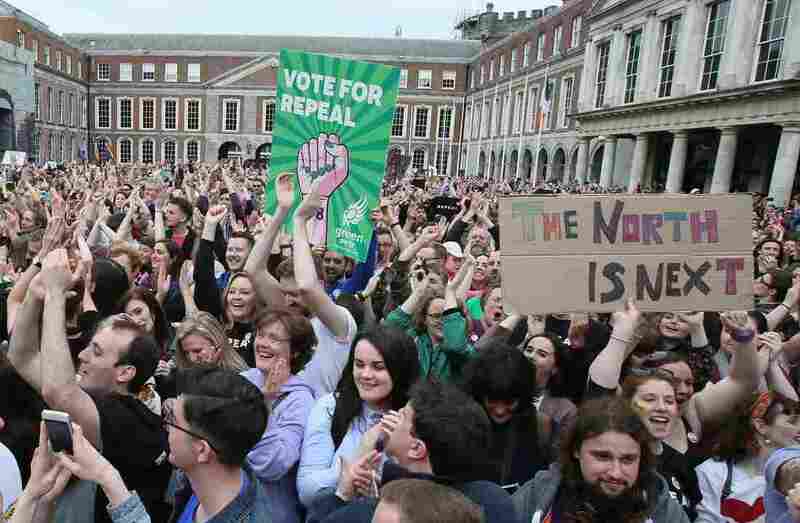 Ultimately, Irish voters backed repeal of the ban — but, as evidenced by their signs, those in favor of repeal were already thinking of what may happen next in Northern Ireland. Before Ireland voted Friday on whether to repeal its constitutional ban on abortion, many observers in the predominantly Catholic, traditionally conservative country expected a close result on the hotly contested question. Then, the Irish actually voted — and it was a blowout. More than 66 percent of the country voted to roll back its strict prohibition against abortion in nearly all cases, opening the door for possible legislation allowing abortion in certain situations. Now, resounding victory in hand, abortion rights advocates are turning their attentions north of the border. There, in the U.K. province of Northern Ireland, authorities maintain an abortion ban as strict as in the Republic. Unlike other parts of the U.K., which allows abortion before 24 weeks of pregnancy and in some other cases, Northern Ireland allows terminations only if a mother's life or long-term health is at risk. Monday, activists outside the city hall in Belfast, the seat of the regional government, demanded: What about us? The answer to that question, though, is not so simple as it may appear. One day before the Belfast demonstrations, the U.K.'s conservative prime minister, Theresa May, congratulated Irish voters on delivering "a clear and unambiguous result" — while, at the same time, remaining a little ambiguous herself on whether Northern Ireland would ever weigh a similar question. On Tuesday, her spokesperson clarified why. "It's important to recognize that the people of Northern Ireland are entitled to their own process which is run by locally elected politicians," James Slack told reporters in London. "We are of the view that this is a devolved matter." May has a convincing political reason, above and beyond any broad theories she may hold on proper governance, to leave the matter entirely with regional lawmakers: It was only with the support of Northern Ireland's Democratic Unionist Party that May was able to form a governing coalition after her Conservative Party suffered painful losses in last year's parliamentary elections — and the DUP is one of the region's staunchest abortion opponents. "Friday's referendum has no impact upon the law in Northern Ireland, but we obviously take note of issues impacting upon our nearest neighbour," the party's leader, Arlene Foster, said in a statement released after the referendum's official results were announced. She said the Irish referendum had been held because the country's ban had been enshrined in its constitution, whereas "no such constitutional bar exists in Northern Ireland." So, Foster asserted, the matter then falls to Northern Ireland's devolved assembly to decide — which would a bit difficult to do, given that the stark partisan divide between the region's two major parties has left it effectively without a functioning government for about a year and a half. And anyway, Foster and her party are content to let the ban stand. "The DUP is a pro-life party and we will continue to articulate our position," she added in her statement. "It is an extremely sensitive issue and not one that should have people taking to the streets in celebration." Still, that did little to dissuade the demonstrators who took to Belfast's streets on Monday, fresh off the news of the vote. At a rally Monday in Belfast, some demonstrators took aim specifically at the Democratic Unionist Party, which reiterated its support over the weekend for Northern Ireland's strict laws on abortion. 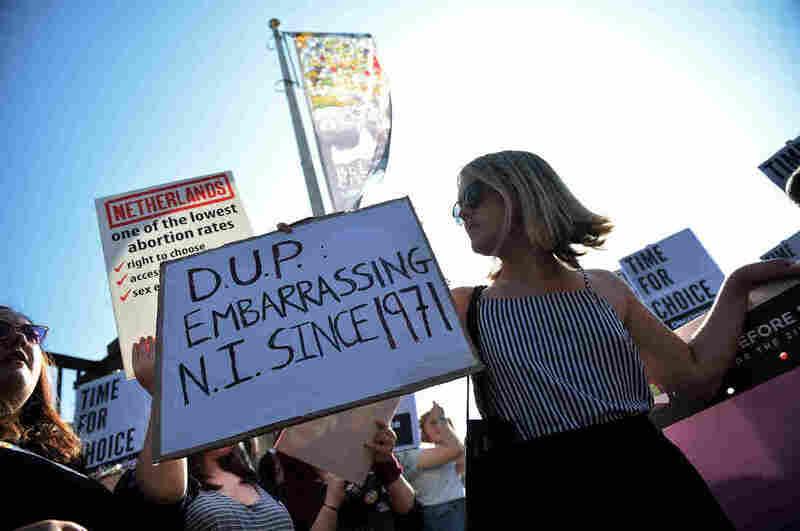 "It is completely crazy abortion is not available here, especially when you see the DUP saying they are part of the UK and have solidarity with England," one Belfast resident told the Irish Times. "But we don't have the same rights as England and now Ireland is changing the law. Everyone should have the choice." And Ireland's prime minister, Leo Varadkar, appears prepared indirectly to offer the Northern Irish that choice even if lawmakers in Belfast don't. NPR's Debbie Elliott reports that his health minister, Simon Harris, says the government is working on a draft bill that would allow elective abortion before 12 weeks of pregnancy, with limited access through 23 weeks. And Varadkar himself, a vocal supporter of the repeal efforts, said it is possible the eventual law would allow Northern Irish women to come south and undergo abortion procedures in the Republic of Ireland. "We do have people who already come to our hospitals from Northern Ireland for healthcare," he said, according to The Guardian, "so I imagine it will be treated as a normal part of our health service."